The use of warfarin in older patients requires special consideration because of concerns with comorbidities, interacting medications, and the risk of bleeding. Several studies have suggested that warfarin may be underused or inconsistently prescribed in long-term care (LTC); no published systematic review has evaluated warfarin use for stroke prevention in this setting. This review was conducted to summarize the body of published original research regarding the use of warfarin in the LTC population. 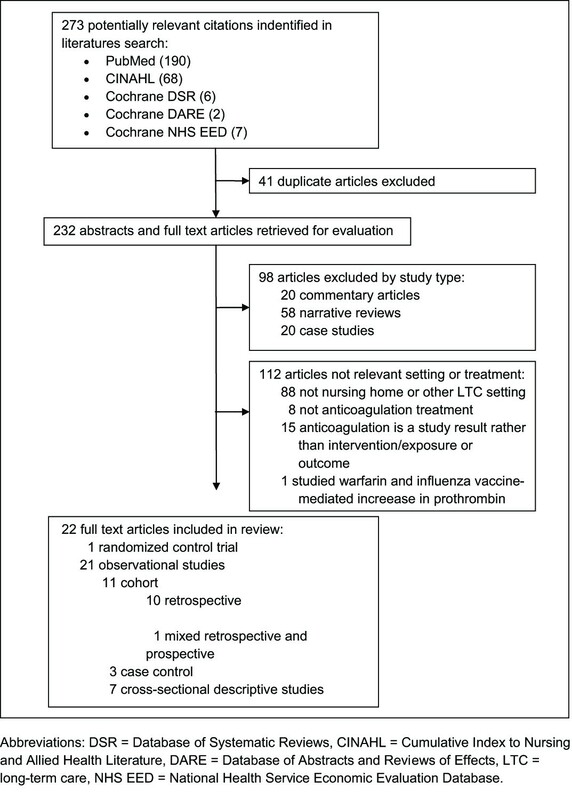 A systematic literature search of the PubMed, Cumulative Index to Nursing and Allied Health Literature, and Cochrane Library was conducted from January 1985 to August 2010 to identify studies that reported warfarin use in LTC. Studies were grouped by (1) rates of warfarin use and prescribing patterns, (2) association of resident and institutional characteristics with warfarin prescribing, (3) prescriber attitudes and concerns about warfarin use, (4) warfarin management and monitoring, and (5) warfarin-related adverse events. Summaries of study findings and quality assessments of each study were developed. Twenty-two studies met the inclusion criteria for this review. Atrial fibrillation (AF) was the most common indication for warfarin use in LTC and use of warfarin for stroke survivors was common. Rates of warfarin use in AF were low in 5 studies, ranging from 17% to 57%. These usage rates were low even among residents with high stroke risk and low bleeding risk. Scored bleeding risk had no apparent association with warfarin use in AF. In physician surveys, factors associated with not prescribing warfarin included risk of falls, dementia, short life expectancy, and history of bleeding. International normalized ratio was in the target range approximately half of the time. The combined overall rate of warfarin-related adverse events and potential events was 25.5 per 100 resident months on warfarin therapy. Among residents with AF, use of warfarin and maintenance of INR levels to prevent stroke appear to be suboptimal. Among prescribers, perceived challenges associated with warfarin therapy often outweigh its benefits. Further research is needed to explicitly consider the appropriate balancing of risks and benefits in this frail patient population. Beginning in the year 2015, the greatest population increases in the United States are expected to occur among persons aged 65 years and older . With increasing age, the risk for developing thromboembolic disease, including deep vein thrombosis (DVT), pulmonary embolism (PE), myocardial infarction (MI), and stroke increases correspondingly. Among stroke survivors or patients with atrial fibrillation (AF), warfarin has been used for prevention of thromboembolic stroke, although among non-cardioembolic stroke survivors without AF, antiplatelet agents are first-line therapy . The use of warfarin in older patients requires special consideration because of comorbidities such as kidney disease and diabetes, the use of multiple and potentially interacting medications, and the risk of bleeding, all of which increase with age and concurrently with age-related diseases [3–6]. A number of studies have suggested that warfarin may be underused or inconsistently prescribed in long-term care (LTC) facilities [7–13]. There are several reasons this may be the case. For one, evidence-based guidelines are not easily developed for the LTC population, and clinical trials measuring the efficacy of warfarin are rarely performed in the LTC setting. Clinicians are thus left with incomplete evidence for generalizing study findings from non-LTC patients to older and more frail LTC residents . Further, clinicians are likely to be concerned about major bleeding in older patients [14, 15] and consequently reluctant to prescribe warfarin when indicated. To objectively reconcile issues of benefit and risk associated with warfarin use in LTC residents and to explore its usage in this setting, a review of the findings from empirical research conducted in this setting is warranted. The purpose of this review was to identify and summarize the body of published original research regarding the use of warfarin in LTC. Because the studies reviewed here differ in purpose, articles are grouped by the most common topics identified: (1) warfarin rates of use and prescribing patterns, (2) association of resident and/or facility characteristics with warfarin prescribing, (3) prescriber attitudes and concerns about warfarin use, (4) warfarin management and monitoring, and (5) warfarin-related adverse events. Two investigators (MN and GR) conducted a systematic search of the PubMed, Cumulative Index to Nursing and Allied Health Literature (CINAHL), Cochrane Database of Systematic Reviews (CDSR), Database of Abstracts and Reviews of Effects (DARE) and National Health Service Economic Evaluation Database (NHS EED) databases (Figure 1). Title, abstract, and text searches for each database were performed for the following search terms: (anticoag* OR warfarin) AND ("long-term care" OR "nursing home"). The search was repeated in PubMed using the Medical Subject Heading (MeSH) database search key words "nursing home" and "long-term care." Additionally, the websites of the Agency for Healthcare Research and Quality (AHRQ) and the American Medical Directors Association (AMDA) were searched. A manual review of references from each pertinent article, review articles, and treatment guidelines was also conducted to identify additional related articles. Literature search and study selection process. Two investigators (MN and GR) independently determined study eligibility, with disagreement resolved by discussion. A study was deemed eligible for inclusion in the systematic review if it: (1) reported on prescribing or use of warfarin alone or in combination with antiplatelet medications in the LTC setting, (2) was published in English, (3) was published between January 1985 and August 2010, and (4) reported original research. Editorials, letters, commentaries, reviews, expert opinions or clinical topic discussions, guidelines, and case studies were excluded from this review. For each included study, data were independently abstracted by two investigators (MN and GR) to include the following details: study objective, intervention/exposure and outcomes, study design, data source, study population, study setting, time period, summary of results, funding source, and quality assessment. Two investigators (MN and GR) compiled lists of strengths and weaknesses in the methodology of each study upon the initial reading. Using the quality assessment methodology for observational studies and randomized controlled trials developed by Williams et al. for the AHRQ , one investigator (GR) responded to the 11 structured closed-ended questions regarding quality for each observational study and the 10 structured closed-ended questions for the single randomized controlled trial reviewed. The initial search of the four electronic databases returned 273 citations, of which 41 were duplicates, leaving 232 citations for abstract and full text review. Upon review, 210 of these were excluded for failing to meet all study selection criteria. Thus, a total of 22 studies [7–13, 17–31] were retained. These included: one randomized controlled trial ; 10 retrospective cohort studies [8, 10, 11, 18, 19, 21–23, 25, 30], one mixed prospective and retrospective cohort study , three case-control studies [7, 26, 31], and seven cross-sectional studies [9, 12, 13, 17, 27–29]. Across all 22 studies, the total number of LTC residents studied was 130,757, with sample sizes in individual studies ranging from 37  to 53,829 . Study duration ranged from 1 month  to 6 years . Among the included studies, 14 reported on the rate of warfarin prevalence and prescribing patterns [7–13, 17–21, 24, 25], eight evaluated the association of resident or facility characteristics with warfarin prescribing [7, 8, 10–13, 17, 18], three reported on prescriber attitudes and concerns regarding warfarin use [27–29], nine discussed warfarin management and monitoring [8, 9, 11, 22–25, 30, 31], and two reported on warfarin-related adverse events [25, 26]. Unless otherwise indicated below, significance was reported at 95% confidence. Of the 14 studies (112,754 total residents) that examined the rate of warfarin use or prescribing patterns in LTC facilities, 11 (Table 1 Part A) [7–13, 17–19, 25] examined residents with various conditions for which warfarin is indicated, comparing residents who were prescribed warfarin with those who were not prescribed warfarin. Three of these studies [20, 21, 24] examined consultant pharmacist interventions with regard to warfarin prescribing in the facilities studied (Table 1 Part B). Among 117 residents (12.5% of 934) with AF, OAC was prescribed for 46%; aspirin or clopidogrel: 40%; no antithrombotic treatment: 21%. Variability in use of any treatment for secondary stroke prevention (warfarin or antiplatelet agent) was observed by race/ethnicity: 58% of American Indians received therapy, 54% of non-Hispanic whites, 49% of non-Hispanic blacks, 46% of Hispanics, and only 39% of Asian/Pacific Islanders. To identify factors relating to initiation and discontinuation of secondary stroke prevention agents (warfarin and antiplatelets) among stroke survivors in nursing homes. In all, 12% initiated drug therapy (warfarin or antiplatelet); 30.3% discontinued. Conditions known to increase the risk of recurrent stroke (e.g. AF) were predictive of initiation. Factors inversely related to initiation of therapy included advanced age, severe cognitive impairment, and being dependent in ADLs. Co-morbid conditions were inversely related to discontinuation of treatment, whereas advanced age and severe cognitive impairment increased likelihood of discontinuation. 6) Validated method for ascertaining clinical outcomes? 2) Selection minimizes baseline differences in prognostic factors? AF was the primary indication for warfarin therapy in two studies (n = 618), accounting for 74%  and 58%  of residents receiving warfarin, respectively. Stroke prevention without AF accounted for 12% , while DVT accounted for 20% , PE for 6% , and either DVT or PE for 26%  of residents receiving warfarin. Eight studies (n = 22,573) [7–13, 19] reported rates of warfarin use across all residents having a condition for which warfarin was indicated. These only included residents having AF or previous stroke; no other indications were described. Four of these studies (n = 2396) [7, 10, 12, 13] also reported the rates of use for warfarin combined with antiplatelet therapy. Rates for warfarin use alone ranged from 17%  to 57% , while the rate of either warfarin or antiplatelet use ranged from 62%  to 80% . Of the eight studies above, five (n = 10,308) [7–11] reported rates of warfarin use among LTC residents with AF that ranged from 17%  to 57%. Abdel-Latif and colleagues  found that 46% of 117 residents with AF in six LTC facilities had been prescribed warfarin; 79% received either warfarin, aspirin, or clopidogrel. In a study of 265 LTC residents with AF in Canada from 2001-2002, Lau et al. found that warfarin was prescribed for 57%; among residents who were considered optimal candidates (high risk of stroke and low risk of bleeding according to the criteria used in this study ), the warfarin prescribing rate was 60%. Using 1993 data, Lackner et al. , in a study of five LTC facilities, found that only 17% of patients with non-valvular AF received warfarin; among residents with AF with ≥ 1 additional risk factor for stroke (besides AF) and no contraindication to warfarin use, only 20% received warfarin . Gurwitz et al. , using data from 1993 to 1995, found rates of warfarin use of 32% in 413 residents with AF. Finally, in a study of 21 LTC facilities from 1997 to 1998, McCormick et al. reported that 42% of residents with AF received warfarin, and only 53% of ideal AF candidates for warfarin therapy (those having no bleeding risk factors) received it. Three studies measured the use of warfarin in LTC facilities among stroke survivors (Table 1 Part A) [12, 13, 19]. Lapane et al. evaluated, among stroke survivors, whether introduction of a prospective payment system (PPS) that required nursing homes to bear the cost for warfarin monitoring had shifted utilization from warfarin to antiplatelet agents. Comparing data from 1997 and 2000, Lapane et al. found that the use of warfarin for the secondary prevention of ischemic stroke did not change significantly following the introduction of the PPS, from 22% in 1997 to 23% in 2000, while antiplatelet use did increase from 41% to 48% over the same period (likely due to the introduction of clopidogrel). Sloane et al. examined 1997-1998 data from residential care/assisted living facilities in the United States and found that 38% of the 435 residents with a history of stroke (type not specified) received neither warfarin nor an antiplatelet agent. Quilliam et al. analyzed records of 53,829 survivors of stroke (either ischemic or hemorrhagic) in all nursing homes in five states from 1992 to 1995 (SAGE database) and found that 67% were not receiving warfarin or any antiplatelet medication for stroke prevention; among residents recently hospitalized for ischemic stroke, 52% did not receive either of these agents. Eight studies [7, 8, 10–13, 17, 18] (a subset of the studies shown in Table 1; n = 100,879), explored the relationship between warfarin or combined warfarin/antiplatelet usage and resident or facility characteristics. All studies used multivariate models to adjust for potential confounders. The direction (negative, positive, none noted [i.e. not significant]) and strength (reported odds ratio [OR]) of reported associations within these multivariate models are summarized in Table 2. Among residents with AF in LTC facilities, both Abdel-Latif et al. (OR = 4.93, 95% confidence interval [CI] = 2.11-11.49 [correction provided by these authors]) and Gurwitz et al. (OR = 1.87, 95% CI = 1.20-2.91), found a positive association between having a history of stroke and receiving warfarin. However, Lau et al. found no significant association between "previous stroke or transient ischemic attack" and warfarin in residents with AF. Both Quilliam et al. (OR = 2.04, 95% CI = 1.95-2.14) and Hughes et al. (OR = 1.76, 95% CI = 1.50-2.06) found that stroke survivors with AF were twice as likely to receive or be initiated on warfarin or antiplatelet therapy, compared with stroke survivors without AF. Although both Lau et al. and McCormick et al. evaluated the association between degree of overall stroke risk and use of warfarin in LTC residents with AF, neither study found a significant association. In one study,  coronary artery disease was significantly associated (OR = 1.06, 95% CI = 1.02-1.11) with use of warfarin or antiplatelets among stroke survivors, but in another study  it was not associated with use of warfarin in residents with AF. While two studies found no significant association between hypertension and use of warfarin in residents with AF [7, 10], two other studies found that in stroke survivors hypertension was positively associated with initiation  (OR = 1.23, 95% CI = 1.09-1.39) and use  (OR = 1.27, 95% CI = 1.22-1.32) of warfarin or antiplatelets. Both Hughes et al. (OR = 1.22, 95% CI = 1.02-1.46) and Quilliam et al. (OR = 1.11, 95% CI = 1.05-1.18) found that stroke survivors with depression were more likely to initiate or receive warfarin or antiplatelet therapy. Both Gurwitz et al. , studying residents with AF (OR = 0.46, 95% CI = 0.22-0.94), and Quilliam et al. , studying stroke survivors (OR = 0.86, 95% CI = 0.82-0.91), found that residents ≥ 85 years were less likely to be prescribed either warfarin  or warfarin or antiplatelets . However studies of residents with AF  and stroke survivors [13, 18], respectively, found no significant correlation between age ≥ 85 years and use of these agents. Hughes et al. evaluated stroke survivors in their first year after nursing home admission: residents ≥ 85 years were most likely to discontinue warfarin or antiplatelet therapy (OR = 1.23, 95% CI = 1.05-1.43). Gurwitz et al. reported that AF residents with dementia were less likely than those without it to receive warfarin therapy (OR = 0.59, 95% CI = 0.38-0.90). Quilliam et al. further found that among residents who were stroke survivors, those with Alzheimer's disease (OR = 0.77, 95% CI = 0.70-0.85) or dementia (OR = 0.84, 95% CI = 0.80-0.88) were less likely to receive warfarin or antiplatelets; the likelihood of anticoagulant or antiplatelet therapy also decreased among residents with moderate (OR = 0.93, 95% CI = 0.88-0.97) or severe (OR = 0.63, 95% CI = 0.60-0.67) cognitive impairment . Hughes et al. also found that stroke survivors with severe cognitive impairment were less likely to initiate such therapy (OR = 0.64, 95% CI = 0.52-0.80). In contrast, Sloane et al. found no significant association between severe cognitive impairment and use of warfarin or antiplatelets in stroke survivors. Both Quilliam et al. (OR = 0.69, 95% CI = 0.64-0.75) and Hughes et al. (OR = 0.73, 95% CI = 0.56-0.96) found that stroke survivors who had dependent physical function were less likely to receive warfarin or antiplatelets than those with independent function. However, Sloane et al. found no significant association between physical dependency and receiving these agents among stroke survivors, and Gurwitz et al. found no significant association between severe physical impairment and the use of warfarin in LTC residents with AF. Abdel Latif et al. found a negative association (OR = 0.18, 95% CI = 0.03-0.91) between previous gastrointestinal (GI) bleed and warfarin use in residents with AF. Quilliam et al. also found a negative relationship (OR = 0.57, 95% CI = 0.52-0.62) between GI bleeding and warfarin or antiplatelet use in stroke survivors. In that study, Quilliam et al. also found a negative association (OR = 0.64, 95% CI = 0.58-0.71) between peptic ulcer disease and these agents, although Lau et al. found no significant association between peptic ulcer disease and warfarin use in AF. Evaluating bleeding risk factors among AF residents, Lau et al. observed no significant association between warfarin treatment and overall bleeding risk or any single risk factor for bleeding, with the exception of recent surgery. However, McCormick et al. reported that the odds of warfarin treatment were significantly lower (OR = 0.51, 95% CI = 0.29-0.94) for residents with AF and ≥ 2 bleeding risk factors. Among residents with a history of stroke, four studies noted an association between race/ethnicity and being prescribed warfarin or antiplatelet therapy. Christian et al. found that non-Hispanic blacks with a recent hospitalization for ischemic stroke and an indication for warfarin received warfarin less often (7.6% lower rate) than non-Hispanic white residents. In a study by Hughes et al. , in the year after nursing home admission, non-Hispanic black stroke survivors were less likely than non-Hispanic whites (OR = 0.62, 95% CI = 0.49-0.78) to be initiated on warfarin or antiplatelet therapy. Quilliam et al. found that black stroke survivors were less likely than whites (OR = 0.80, 95% CI = 0.75-0.85) to receive warfarin or any antiplatelets. Although Abdel-Latif et al. reported that non-Caucasian stroke survivors with AF were less likely than Caucasians to be prescribed warfarin therapy, these findings appear to be bivariate and were not significant in their multivariate model (OR was not reported). For residents within residential care/assisted living facilities, Sloane et al. explored the association between resident and facility characteristics and warfarin or antiplatelet prescribing for stroke survivors. Although bivariate analysis found that several facility characteristics, including larger facilities and those with registered nurses or licensed practical nurses, were associated with non-prescribing, multivariate analysis found no independent association for resident or facility characteristics. After adjusting for facility and resident characteristics, Hughes et al. found that LTC facilities with white-only residents (OR = 0.74, 95% CI = NA) or the presence of full-time physicians (OR = 0.76, 95% CI = 0.63-0.93) were less likely, and that those that were part of a chain (OR = 1.20, 95% CI = 1.01-1.42), were more likely, to initiate warfarin or antiplatelets in stroke survivors. Moreover, facilities with > 10% non-white residents (OR = 1.22, 95% CI = 1.03-1.43), in an urban location (OR = 1.38, 95% CI = 1.16-1.65), having physician extenders on staff (OR = 1.21, 95% CI = 1.0-1.47), or having special care units (OR = 1.33, 95% CI = 1.02-1.73) were more likely to discontinue active warfarin or antiplatelet therapy. Quality assessment ratings are listed for each of the 14 studies in Table 1. Methodological quality of each study was adequate for all but four areas. One or more limitations or concerns were noted for nine studies [7, 9, 11, 13, 17, 18, 21, 24, 25]. These included failing to adequately account for potential confounders, failing to consistently describe statistical error for the point estimates reported or to adequately model the relationship between stroke and bleeding risk with warfarin use. In the last case, typical problems noted were either omitting risk factors or else failing to score risks using a validated scoring method or consensus guidelines. Four studies [7, 9, 17, 21] had small sample sizes: subject counts for these studies would not have been able to support a finding of 95% significance for an OR of 1.5. Four studies [17–19, 24] had limitations in length of follow-up. Two studies (n = 289) [27, 29] explored physician attitudes toward warfarin prescribing using case-study questionnaires targeted to physicians (Table 3), while one study (n = 91)  (Table 3) explored physician attitudes regarding specialized warfarin services. Dharmarajan et al. evaluated respondent decisions regarding the use of warfarin therapy in the hypothetical case of a white 87-year-old female LTC resident with a history of Alzheimer's disease, surgery for a hip fracture, and AF. The resident, who was wheelchair-bound and dependent for most activities of daily living, had swelling on her forehead from a recent fall, but was negative for fracture on radiological examination. A large majority of responding physicians (85%) believed that long-term warfarin therapy was not indicated for this patient. However, most (88%) said they would prescribe an antiplatelet agent. The reasons most commonly cited for not prescribing warfarin were risk of falls (98%), dementia (40%), and limited life expectancy (32%). AF, atrial fibrillation; AHRQ, Agency for Healthcare Research and Quality; CAD, coronary artery disease; CHF, congestive heart failure; CI confidence interval; CNS, central nervous system; GI, gastrointestinal; INR, international normalized ratio; LTC, long-term care; NA not available. In a similar study, Monette et al. used two case studies - a 94-year old male with chronic AF and co-morbid CHF but having independent physical function and no fall history, and an 80-year old female stroke survivor with AF and CHF who also had hemiplegia, dysarthria, and a recent fall history--to assess physicians' knowledge and attitudes regarding the use of warfarin for stroke prevention in residents with AF. Only 47% of respondents believed that the benefits of warfarin therapy greatly outweighed the risks in this setting; the remainder indicated that benefits outweighed the risks only slightly (34%) or that the risks outweighed the benefits (19%). Contraindications to warfarin use that were cited most frequently included excessive risk of falls (71%), history of GI bleeding (71%), history of other non-central nervous system (CNS) bleeding (36%), and history of cerebrovascular hemorrhage (25%) . Geriatricians were significantly more likely than other physicians to recommend warfarin in the older but more functional case-study resident. Harrold et al. explored physician attitudes regarding the use of specialized warfarin services in the LTC setting. The majority of physicians agreed that a warfarin service could reduce the workload on physicians and increase the percent of time that residents receiving warfarin are maintained in the target therapeutic range. However, most physicians did not believe that such a service would reduce the risk of warfarin-related bleeding. Only about half of respondents indicated that they might use a warfarin service for managing their residents on warfarin. Although the three physician surveys described above were innovative, their methodological quality was somewhat low in critical areas. While all three studies introduced new self-administered questionnaires, only one analyzed data regarding non-responders , while two [27, 28] did not mention steps taken to develop content validity. None of the surveys provided details regarding analysis of item response for the purpose of assessing construct validity. Finally, all three studies had limitations with analysis: failure either to adequately report statistical error or to cross-tabulate responses with subject attributes. The quality of warfarin management and monitoring (Table 4 Part A) was measured in seven studies (n = 10,718) [8, 9, 11, 22, 25, 30, 31], six of which (n = 10,681) [8, 9, 11, 22, 25, 30] evaluated the percentage of time or person-days spent by residents in therapeutic range, based on INR results. In these six studies, INR levels were in the target range (2.0-3.0) for a mean 48% of the time (range = 37-55%). Four of these studies [8, 11, 22, 25] also reported percentage of time or person-days in subtherapeutic or supratherapeutic ranges. INR levels were in the subtherapeutic range (< 2.0) for a mean of 38% of the time (range = 35-45%) and in the supratherapeutic range (> 3.0) for a mean of 14% of the time (range = 11-16%). One study, Karki et al. , reported only mean INRs for residents and only for those whose INR values indicated either adequate or poor INR control. Two studies that evaluated the effectiveness of warfarin medication management systems [23, 24] (n = 175, Table 4 Part B) found post-interventional time in therapeutic range considerably higher than reported in the six studies above. Papaioannou et al. studied the effects of an electronic decision-support system for warfarin dosing and found that time in therapeutic range was 65% (pre-intervention) to 69% (post-intervention; the post-interventional change was non-significant). In a study of warfarin management by nurse practitioners, Allen et al. measured 85% of INR draws within therapeutic range. These measurements were post-intervention only; no pre-intervention or control results were reported. Three studies [22, 30, 31] (Table 4 Part A) evaluated the association of resident characteristics with INR (n = 302). Aspinall et al. noted that residents who began warfarin therapy before the study period and those who did not have a history of stroke were more likely to maintain INR values within the therapeutic range. Karki et al. observed that a group of LTC residents with INR fluctuations > 0.99 between blood samplings received more medications known to interact with warfarin vs a group with INR fluctuations ranging from 0.5-0.99. Verhovsek et al. found that residents receiving interacting medications spent less time in therapeutic range. Time in therapeutic range varied significantly among prescribing physicians . The three studies cited above [22, 30, 31] (Table 4 Part A) also evaluated the use of potentially interacting medications among residents receiving warfarin for any condition (n = 302). Aspinall et al. reported that 89% of residents were receiving a medication that potentially interacts with warfarin. The most common agents were omeprazole (51% of residents), simvastatin (45%), aspirin (34%), citalopram (18%), and levothyroxine (13%). Karki et al. reported that 46% of LTC residents were prescribed a potentially interacting agent during the study period. Verhovsek et al. found that 79% of residents were prescribed more than one warfarin-interacting medication during a 12-month period; most common were acetaminophen (40% of residents), citalopram (25%), aspirin (16%), diltiazem (11%), and simvastatin (10%). Overall, in the nine warfarin management and monitoring studies described above (Table 4 Parts A and B), methodological quality was low to moderate. Low power was common: five studies [9, 22, 23, 30, 31] had an insufficient number of subjects to find 95% significance for an odds ratio of 1.5. Four studies [22–24, 30] had either inadequate descriptions of resident follow-up or insufficient follow-up periods to achieve the stated study purpose. Seven studies [9, 11, 22–25, 31] had deficiencies either in adequately analyzing or reporting study findings or in accounting for potential confounders. Two studies [25, 26] (Table 5) sought to evaluate adverse warfarin-related events in the LTC population (n = 17,429). In a study of 25 nursing homes, Gurwitz et al. determined the combined overall rate of adverse warfarin-related events (18.8 per 100) and potential adverse warfarin-related events (6.6 per 100) to be 25.5 per 100 resident-months on warfarin therapy. Of the adverse warfarin-related events, 11% were deemed serious and 2% were life-threatening or fatal. Overall, 29% of the adverse warfarin-related events were considered preventable; of the serious, life-threatening, and fatal events, over half (57%) were considered preventable. Quilliam et al. explored an association between warfarin and the antiplatelet agents (excluding clopidogrel, which was not yet available) and risk of hospitalization for bleeding among LTC residents. After adjustment for demographic characteristics and medications, use of warfarin, compared to no warfarin or antiplatelet medication, was associated with a significantly increased risk of hospitalization for bleeding. Recipients of warfarin plus aspirin were more likely to be hospitalized for a CNS bleeding event; recipients of warfarin alone were more likely to be hospitalized for a GI bleeding event. Except for limitations in one study, which neither adequately controlled for confounding nor explored the association of poor INR control with warfarin-related adverse events or resident characteristics , methodological quality for these two adverse event studies was acceptable. Results from this review show that AF, DVT, PE, and stroke prevention in residents without AF, account for nearly all warfarin use in the LTC setting [24, 25]. Of these four, AF is the primary indication for warfarin use, accounting for the majority, or as many as three of every four residents receiving this agent in LTC [24, 25]. Current consensus guidelines, including those of the American College of Chest Physicians (ACCP) [32–34], American College of Cardiology/American Heart Association/European Society of Cardiology (ACC/AHA/ESC) , and the ESC alone , strongly support the use of warfarin in patients with AF who have one or more high risk factors or two or more moderate risk factors for stroke, especially among those not at high risk for bleeding. The American Medical Directors Association (AMDA) guidelines for stroke management in LTC, updated in 2011, also recommend warfarin as primary therapy for stroke prophylaxis in AF, but suggest that a systematic assessment of stroke and bleeding risk be performed prior to initiation of therapy . Lau et al. in this review found that nearly all LTC residents with AF were at high risk for stroke simply because 88% of residents were ≥ 75 years of age. Current AMDA guidelines cite a general low use of warfarin in residents with AF who have no contraindications for its use . Evidence from five LTC studies in our review suggests a pattern of improving but still low rates of warfarin use in AF: among LTC residents with AF studied since 1997, between 46% and 60% were prescribed warfarin [7, 10, 11]; in earlier studies dating to the mid-1990s, only 17% to 32% received warfarin [8, 9]. Our findings suggest that bleeding risk alone may not explain the low rates of warfarin use for AF in LTC. Even among candidates described as having high stroke risk and low bleeding risk, rates of warfarin use among LTC residents with AF in three studies were 20% , 53% , and 60% . Physician concerns may, in part, explain low observed warfarin use in the LTC setting. Surveys of physicians using case-study examples showed that respondents strongly supported use of antiplatelet agents . However, these same respondents appeared reluctant to prescribe warfarin for the case-study residents, each of whom had AF plus one or more major risk factors for stroke. Only half of surveyed physicians agreed that benefits of warfarin therapy greatly outweigh the risks . Specific concerns motivating physicians to avoid using warfarin seem clear, starting with risk of falls in two studies (71% and 98%) [26, 28], and including dementia , short life expectancy , history of GI bleeding , history of other non-CNS bleeding , and history of cerebrovascular hemorrhage . In this review, several factors were associated with greater use of stroke prevention therapy--AF in stroke survivors [12, 18], history of stroke [7, 8] in residents with AF, hypertension [12, 18] in stroke survivors, and depression [12, 18] in stroke survivors. Dementia and severe cognitive impairment were generally associated with lower use or initiation of stroke prevention therapy in LTC [8, 12, 18]. Previous GI bleeding was also strongly and negatively linked to use of warfarin or antiplatelets in patients with AF and in stroke survivors [7, 12]. This review also found that black race was generally associated with lower, adjusted use of therapy. Although one study  did not find a significant multivariate association between African-American race and use of warfarin or antiplatelets in stroke survivors, the number of observed subjects (n = 117) may have been too small to adequately test this factor. Three other studies [12, 17, 18] that examined the same therapies in strongly powered multivariate models found evidence of a significantly lower use of these agents among black compared with white stroke survivors. Conflicting findings or no evidence of association were found across studies for other resident characteristics and use of stroke prevention therapy: age ≥ 85 years (reduction or no association), coronary artery disease (increase or no association), dependent physical functioning (reduction or no association), peptic ulcer disease (reduction or no association), high overall bleeding risk (reduction or no association), and overall stroke risk (no association). Studies in this review consistently showed that in LTC residents receiving warfarin, INRs are in the target range approximately half of the time [8, 9, 11, 22, 25, 30]. With further evidence that only one in five residents exceed 60% of monitored time in therapeutic range , achieving INR targets is a potentially serious problem in the LTC setting. Comparing mean values reported in this review, residents who fall out of target range are 2.5-3 times more likely to have INR levels that are subtherapeutic, which exposes them to a potentially greater risk of stroke, rather than supratherapeutic, which would increase their bleeding risk. Studies in this review suggest that blood draws in LTC occur frequently [8, 30], at least once per month for 84% or more of residents [8, 30], and more often for many residents [23, 24]. McCormick et al. discuss the seeming paradox in the controlled-care environment of LTC where such INR control problems often occur. Although non-adherence to medication or INR monitoring poses fewer problems in the LTC setting, and despite potentially better control of interacting medications and diet, warfarin prescribing and INR monitoring appear less than optimal . Several factors may be associated with reduced time in INR therapeutic range. These include history of stroke  and medication interactions [22, 31]. Regarding the latter, evidence from this review suggests that the opportunity for warfarin interactions in the LTC facility is great, with 46-89% [22, 30, 31] of residents taking a potentially interacting medication. The two studies that evaluated medication management systems [23, 24] reported substantially higher post-intervention times in target range than those discussed above. However, in one of these studies , the use of an electronic decision support system for warfarin dosing produced no significant gain across facilities in time-in-range when compared to the pre-intervention period. Findings from the second study  showed that 85% of post-intervention INR draws were within range; however, these results are largely uninterpretable, since the study lacked pre-intervention data or a separate control group. Although no study to date has established a link between poor INR control and health outcomes in LTC, warfarin-related adverse events are common in the LTC facility: the combined overall rate of adverse warfarin-related events and potential adverse warfarin-related events was high, equivalent to one adverse effect for every 4 months on therapy . The use of warfarin was also associated with a significantly increased risk of hospitalization for a bleeding event . Consensus guidelines regarding the use of warfarin for primary or secondary stroke prevention in AF may not be sufficiently followed in the LTC setting, where warfarin use appears suboptimal. The challenges of warfarin use in the LTC setting are apparent to physicians and, in their view, may outweigh the benefits of stroke risk reduction. For LTC residents who are receiving warfarin, maintaining therapeutic INR remains problematic, even in the highly controlled LTC environment. Further research is needed to evaluate appropriate use of anticoagulants in this setting, including a more explicated consideration of the appropriate balancing of risks and benefits in an important but problematic issue for the geriatric clinician. The current study was sponsored by Janssen Scientific Affairs, LLC. The involvement of the study sponsor in the collection, analysis, and interpretation of data; in the writing of the manuscript; and in the decision to submit the manuscript for publication was limited to the contribution, as noted above, of two coauthors (AAP and WWN), who were employees and stockholders of the study sponsor. MN and GR received compensation for their work in conducting the literature review and for manuscript production. The authors would like to acknowledge Ruth Sussman, PhD, who provided editorial review of this author-prepared manuscript, whose work was supported with funding from the study sponsor. AAP and WWN are employees of Janssen Scientific Affairs, LLC (a Johnson and Johnson company) and shareholders of Johnson and Johnson. At the time this research was conducted, MN and GR were consultants to Janssen Scientific Affairs, LLC and received funding for this research and writing of the review manuscript. Janssen Scientific Affairs, LLC separately provided financial support for editing services and for the article processing charge associated with this author-prepared manuscript. Over the past five years GR also received funding from Pfizer Inc. for contracted research and services and development of other manuscripts. The authors declare no other financial or non-financial competing interests. Coauthors' contributions to this manuscript include the following: MN (study design, article search and summarization, table production, analysis, manuscript production), AAP (initial study concept, study design, manuscript rewrite), WWN (study design, critical review, manuscript rewrite), GR (study design, article search and summarization, table production, analysis, manuscript production). All authors read and approved the final manuscript.